HIGHBRIDGE — The early-morning commutes, when bleary-eyed Bronx youngsters ride bus and rail to distant schools while parents fret for their safety, will end soon for a lucky batch of sixth-graders. In September, the Highbridge Green School will welcome its first class of 130 students — beneficiaries of a years-long campaign to bring a middle school to the roughly 40,000-member neighborhood that has gone for decades without one. It's designed to be a school worth waiting for — a state-of-the-art building boasting the city's first-ever green roof on a new public school. The application deadline for current fifth-graders hoping for a seat is March 6. Plans for the new building at 200 West 167th St., which should be completed in May, call for a roof outfitted with wind turbines and solar panels, heat-absorbing greenery, a rainwater harvesting system and a greenhouse for growing vegetables and raising fish. All of this will connect to a science lab, said parent and organizer Chauncy Young. “It’s definitely going to be one of the greenest schools ever built,” Young said. Kyle Brillante, the proposed principal, described his vision for the school at a packed parent meeting Tuesday at nearby P.S. 11. The middle school will hold students to rigorous standards, provide a safe and supportive learning space and promote physical health, he said. That means nightly homework and a minimum 70-percent average in all classes to be promoted. Brillante also envisions advisers who stick with students all three years, uniforms, after-school activities (budget permitting) and student-grown vegetables served in the cafeteria’s "Garden Café." “We’re going to raise fresh vegetables,” Brillante said to cheers. "Then we’ll eat them!" Current fifth-graders zoned to attend one of the four Highbridge public elementary schools — P.S. 11, 73, 114 or 126 — will receive priority for the 130 sixth-grade seats. Other District 9 and 10 students will be given any leftover spots. Interested parents of eligible students must rank the Highbridge Green School, or M.S. 361, as their No. 1 priority on a special new middle-school application given to fifth-graders this week. 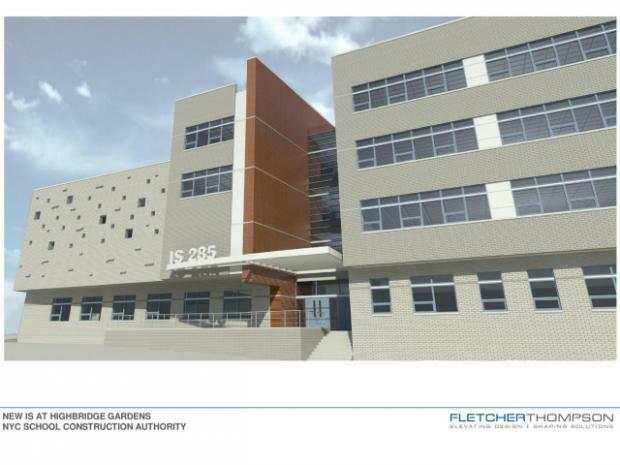 Highbridge parents have been clamoring for a neighborhood middle school ever since P.S. 73 lost its upper grades in the 1960s, said parent and organizer Jose Gonzalez. Gonzalez said the distance kids travel to get to middle school leaves many parents worried about safety. In 2006, a group of Highbridge parents and advocates resolved to convince the city to build a neighborhood middle school. The group, Highbridge United, rounded up support from local clergy, principals and elected leaders, who helped them secure a meeting with Department of Education officials. The coalition’s first hurdle was to propose a spot for the school. The tenants association at the Highbridge Gardens development stepped in and voted to approve a plan in which NYCHA offered up an unused parcel — the school's current site. Then the group battled with the DOE over seats. The parents wanted 1,000, since nearly 500 fifth-graders graduate from the local elementary schools every year. But the DOE said a 390-seat school was feasible and would meet the community’s needs. The group accepted that offer. After the DOE included the school in its capital plan, education officials concluded that the planned green roof would be too pricey. That's when parents turned to local elected leaders, who raised about $2 million for its construction. With the funding and location finally secured, the City Council voted to approve plans for the school in 2010. The school will launch in September with sixth-graders only, but will grow to its full sixth- to eighth-grade enrollment in 2016. De Los Santos said she and her husband had considered moving out of The Bronx so that her daughter, Lyana Dominguez, could avoid the dreaded middle-school commute. But the family now plans to stay, hopeful Lyana will land a seat at Highbridge Green School, where she already can imagine growing broccoli, string beans and lettuce, then learning the science behind it. “I’m looking forward to a good education,” Lyana said.